A typical small van is little more than an empty box on wheels: functional, certainly, but seldom innovative or smart. But designers from Nissan Design Centre (NDC) in Japan and Nissan Design Europe in the UK had other ideas. In designing NV200, the joint team have devised a concept that could revolutionise the small van market. “A commercial vehicle has a specific job to perform, but that’s no reason to design a purely rational vehicle with no warmth. In NV200, function becomes the aesthetic. NV200 is a highly efficient tool but one with a human touch.” Shiro Nakamura, senior vice president and chief creative officer at Nissan Motor Co., Ltd. When world-renowned marine biologist and underwater photographer Dr Alex Mustard sets off on an expedition, he takes with him a mountain of equipment. He needs underwater cameras and lights for his photography plus scuba diving equipment such as wet suits, flippers, masks, air tanks and breathing apparatus. He even takes an underwater scooter for recognisance trips beneath the surface. He carries with him computer equipment for downloading his digital images once he resurfaces and he needs mobile communication equipment to send the images to clients or research centres. Naturally he needs a change of dry clothes and if he is planning on being out on an expedition for more than a few hours, he needs food, water and perhaps somewhere to sleep. In fact, he takes enough gear to fill a small van. And he would benefit enormously if that van could double as a mobile office. As far as Dr Mustard is concerned such a vehicle has been nothing more than a dream... until now. One of the stars of Nissan’s stand at this month’s Tokyo Motor Show is the NV200, a concept for an entirely new sort of small van that answers all the marine biologist’s needs. By having no pre-conceived ideas about what form NV200 should take, the joint design team from Japan and the UK has developed a radical, futuristic, but entirely practical new concept. In Japan, the team was led by Ryoichi Kuraoka, Product Chief Designer. In the UK, the team was led by Stephane Schwarz, design director of NDE, exterior designer Martin Uhlarik and interior designer Hironori Oyama. And although developed to answer one user’s very specific requirements, the basic concept has serious potential for all manner of different customers. 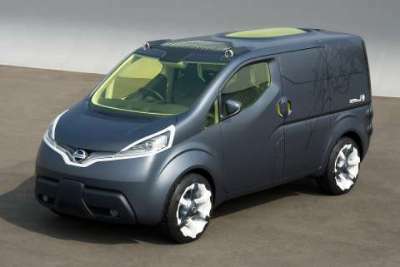 From the outside, NV200 concept is the epitome of a modern van. A cab-forward design, the wraparound grille blends into upswept swage lines on either side of the cabin. Dramatically rising side windows accentuate a high waistline and underline the van’s practical, load carrying ability. NV200 sits on a usefully long 2,820 mm wheelbase and is 1,840 mm tall, providing a practical, roomy load space. But it’s the details that really count. At the heart of NV200 is a patented sliding cargo pod which is divided into a number of separate areas into which different pieces of diving and photographic equipment can be stored. The pod is latched inside the shell of the load area when the van is being driven. But upon arrival at its destination, it slides out rearwards to allow easy access to the storage zones. The pod is deployed manually with the aid of hydraulic rams and sits securely on integrated ‘drop-down’ legs when fully extended. As well as housing diving gear in separate ‘wet’ lockers, the pod holds four air tanks and there’s an area specially shaped to hold the underwater scooter securely. Lockable roller blinds protect the contents, while valuable camera equipment can be accessed either from within NV200 or from outside the pod. As the pod is withdrawn from the van, the area left behind is transformed into a mobile office and IT dock. A computer table drops down from the side of the van to reveal two LCD screens upon which images can be edited. The front passenger seat swivels backwards on a single curved rail to face the table. A shockproof briefcase made from rugged ribbed plastic houses a laptop. When not in use, it docks into a side of the van beneath the worktable. A magnetic clipboard is attached to the opposite wall of the workspace, while moveable storage boxes are mounted in all three doors. Natural light for the work surface comes from a small side window above the bank of screens and from a large domed skylight in the roof of the van. In tropical climates, the skylight can be diffused to prevent a build up of heat within the interior. The end of the pod facing the inside of the van - it forms a bulkhead behind the front seats when the pod is not deployed - has hanging space for dry clothes. It also houses a small refrigerator, an extending sink unit and first aid kit. NV200’s tanks hold enough water to supply a shower, fitted on the outside of the pod, to allow diving equipment to be washed after use. Power for the computer, shower, ‘fridge and other electrical fixtures comes from a small generator housed within the van. This, in turn, is charged by solar panels situated on the roof of the pod. When the pod is deployed, the solar panels are directly exposed to daylight. But even when the pod is pushed back into the van, the panels line up beneath the skylight. In this way, power can be generated in daylight hours whether the vehicle is stationary or not. A two-man tent - accessed from outside NV200 - is housed at the base of the B-pillar behind the driver’s door, while fillers for fuel and water are housed within the opposite B-pillar. The driver and passenger doors open conventionally, while access to the workspace is via a single sliding door on the passenger side. The cockpit area reflects form and function. The skeletal aluminium seat frames are covered in a washable contoured material similar to the fabric used in sports shoes, with a 3D texture for extra grip. Large open storage areas run the width of the van beneath the instrument panel and control cluster. Sensors within the storage zones detect movement and illuminate the entire area as soon as a hand or an object is placed in or near the shelves. With no centrally mounted rear view mirror needed, its location has been filled by a small colour TV screen. A rear-facing camera - a familiar Nissan feature that up until now has been used as solely a reversing aid - projects the view behind the van to the screen at all times. Above the front seats is a glass panel incorporating a wave pattern. It bathes the interior in a diffused light, while any outside movement casts shadows in the cabin that resemble life under water. On either side of the panel are two forward-facing glazed holders into which highpowered professional underwater torches can be slotted. When parked, the torches provide a floodlit area ahead of NV200. Most the materials, textures and colours used throughout NV200 concept reflect the materials, textures and colours used in the diving world. The exterior has a scratch resistant matt satin finish in a steel grey colour to emphasise the ‘toolbox’ nature of the project. Interior materials are either hardened lightweight plastics or rubberised fabrics finished in a dark grey with acid yellow highlights. The glass is also tinted yellow. Underwater and organic references can be found all over NV200. The purpose-made 20-inch alloy wheels feature have six ‘arms’ that appear to grip the tyre itself, octopus fashion. The tread pattern on Goodyear’s tyres - also specially designed for NV200 - incorporate octopus suckers onto a trainer-style sole. Inspiration for the translucent ribs of the wraparound grille also came from underwater creatures while the design of the tail and indicator lenses reflect layers of an onion. 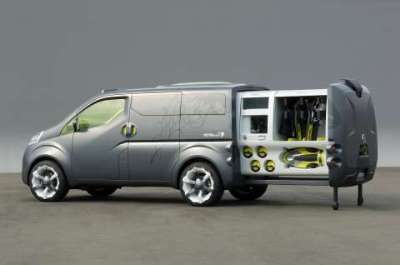 Liberal use of warning signs and instructions found on the exterior of NV200 were borrowed from the practical graphics found on diving equipment. The designers in the UK have allowed themselves one small visual joke. Opening the sliding door reveals the legend ‘Mind The Gap’ on the step up into the work area... a reference familiar to anyone using London’s Tube network. Perhaps the only area not directly influenced by the ocean, is the wooden floor of NV200. This is finished in a hardwearing but entirely natural ebony, bringing a touch of warmth to an otherwise working environment. Although the NV200 has been designed to suit the specific needs of one user, the principle behind the concept has wide ranging potential. The team has identified mobile libraries, greengrocery stores, florists and even field ambulances among possible users of the pod. “Although NV200 might, at first glance, appear to be a flight of fancy, the more you study its potential the more you realise it is an entirely practical and feasible project,” says Nakamura. “Nissan prides itself on designing its cars to fulfil the needs and requirements of its customers. For NV200 we have taken that guiding principle quite literally and designed a vehicle for one specific customer. But it is a totally adaptable and flexible concept that could have applications in a number of areas of the market,” he adds. And the verdict from Dr Mustard, the man around whom the concept was developed? “Perfect... just perfect. It even answers needs I hadn’t realised that I had. I only have one question: when will NV200 be put into production?” he says. NV200 also features an environmentally friendly clean diesel engine. It is equipped with a number of safety systems based on Nissan’s Safety Shield concept, including Back View Monitor and Distance Control Assist System.